Israel Adesanya and Kelvin Gastelum squared off for the promotions interim middleweight championship in the co-headliner of tonight’s UFC 236 event. Kelvin Gastelum is coming off back-to-back victories over Michael Bisping and Jacare Souza in his most recent efforts. ‘KG’ was slated to fight current 185-lbs champ Robert Whittaker at UFC 234, but “The Reaper” was forced out last minute due to health issues. 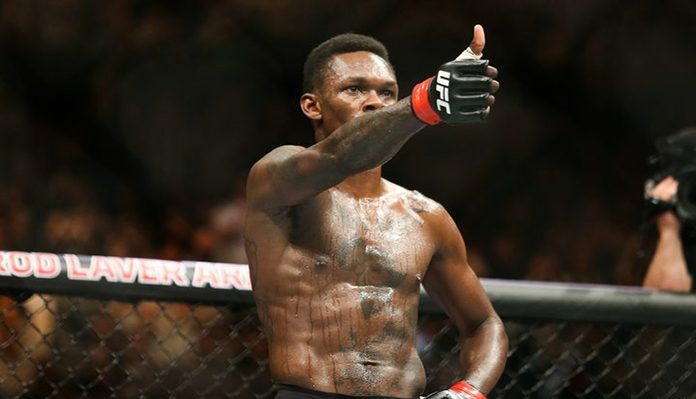 Meanwhile, Israel Adesanya was most recently seen in action at February’s UFC 234 event, where he defeated Anderson Silva via unanimous decision. “Stylebender” will enter tonight’s contest sporting an undefeated professional record of 16-0. Round one of the UFC 236 co-main event begins and Gastelum comes out quickly. Adesanya gets into his classic stance and looks for a kick. Gastelum avoids but eats a low kick. He continues to hunt Israel and lands a low kick of his own. That strike is answered with a hard body kick from Adesanya. Kelvin with a left hook that partially connects. He lands a body kick after failing to clinch up. Adesanya misses with a straight right. Gastelum circles along the outside and then catches Israel with a left hook that sends Adesanya crashing into the cage. Kelvin looks to follow up but Adesanya avoids and circles out. Kelvin catches a kick and then throws another big left. That partially landed. Two minutes remain in round one. Gastelum with a flurry. He is doing a good job of closing the distance. Israel with a low kick. Gastelum with another left and then a low kick. Adesanya with a jab up the middle. Gastelum slides out of the way of a second shot. Kelvin with a right hook. The horn sounds to end round one. Round two begins and the UFC 236 co-main event is back under way. Adesanya with a body kick and then another. Gastelum goes to the body with a left hook. Adesanya feints with a kick. Gastelum comes over the top with a left. Adesanya misses with a right and eats a jab for his efforts. Gastelum with a good left. Israel replies with a body kick. Gastelum with a jab but Adesanya answers with a knee. Kelvin with a nice slip and rip. Two punch combo lands. Adesanya goes upstairs with a high kick. That is partially blocked. Gastelum continues to press and lands another combination. Israel Adesanya with a right hand that drops Gastelum. He looks to follow up with ground and pound but Kelvin is back up. Adesanya with a high kick now. Kelvin avoids. Israel with a nice combination. Gastelum responds with a left hand. Another big right hand from Adesanya rocks Gastelum. Under one minute remains. Adesanya with a a spinning back elbow. Kelvin is rocked but continues to press. Gastelum with a counter left. He shoots for a takeodown but it is not there. The horn sounds to end round two. Round three begins and Kelvin Gastelum lands a body kick. Israel Adesanya returns fire with one of his own. Gastelum is circling but Adesanya is there to cut him off. Israel with a left. He lands a low kick. Gastelum just misses with a left hook. Adesanya smiles and takes the center of the octagon. Adesanya with a body kick. Gastelum leaps in with a right. He lands a nice low kick. Adesanya answers with a high kick. He follows that up with a right hand and then a knee to the body. Two minutes remain now. Gastelum swings and misses with a left. Adesanya is using his reach perfectly now. Kelvin with a deep breath and then a left hand. He shoots in and scores a takedown late. Israel pushes him off and gets back to his feet rather easily. He lands a low kick. Gastelum returns fire. Israel with a jab. He comes forward with a high kick. Gastelum avoids. The fighters trade low kicks. Round three comes to an end. Round four begins and Gastelum comes forward with a ton of pressure. He lands a combination. Adesanya circles but Gastelum stays on him. Israel with a low kick. Gastelum lands a straight left. Adesanya with a nice knee to the body. Gastelum comes forward but eats a low kick. Adesanya with a hard right. Gastelum eats it and presses forward. Israel circles to his left. Gastelum swings and misses with a hook. He throws a combination and pushes Israel against the cage. Adesanya breaks free but Gastelum is all over him. Israel appears to be cut. Gastelum and Adesanya exchange punches in the pocket. Under two minutes remain in round four. Kelvin with a sharp left hand. He goes to the body with a jab. Adesanya replies with a stiff jab. He rocks Adesanya with a kick followed by a left. Gastelum continues to press forward. Adesanya answers with a high kick. Gastelum goes low. Another good left from Kelvin. The horn sounds to end round four. Round five of the UFC 236 co-main event begins and Kelvin Gastelum comes flying across the cage. Israel circles away from the cage and lands a low kick. Another hard low kick from Israel. Kelvin eats a front kick to the face but comes forward with a left. He follows that up with a low kick. Adesanya with a huge right hand. He locks up a guillotine but Gastelum escapes and lands on top. Israel locks up a triangle but Gastelum escapes and we are back to standing. Big right hand from Adesanya. Kelvin replies with a left. Gastelum with a left hook. Adesanya with a huge right hand up the middle. Somehow Kelvin eats it. Both men with big shots. Now Adesanya with low kicks. Gastelum shoots in for a takedown but Israel says no. Adesanya with a right that stuns Kelvin. Gastelum bites down on his mouthpiece and comes forward. Israel drops him with a right. Kelvin is right back up and pushes Adesanya against the cage. Israel breaks free and lands a right. Kelvin goes down. Israel with an elbow. Adesanya takes his back and lands punches. Kelvin back up and gets dropped again. He continues to fight on until the horn sounds. Wow!